■ ELEGANT ORGANIZATION: Keep your devices in one place with the soft silicone anti-scratch cradle to keep your device firmly docked while charging. Reduce cable clutters and reduce the risk of devices getting pull off the table while charging. 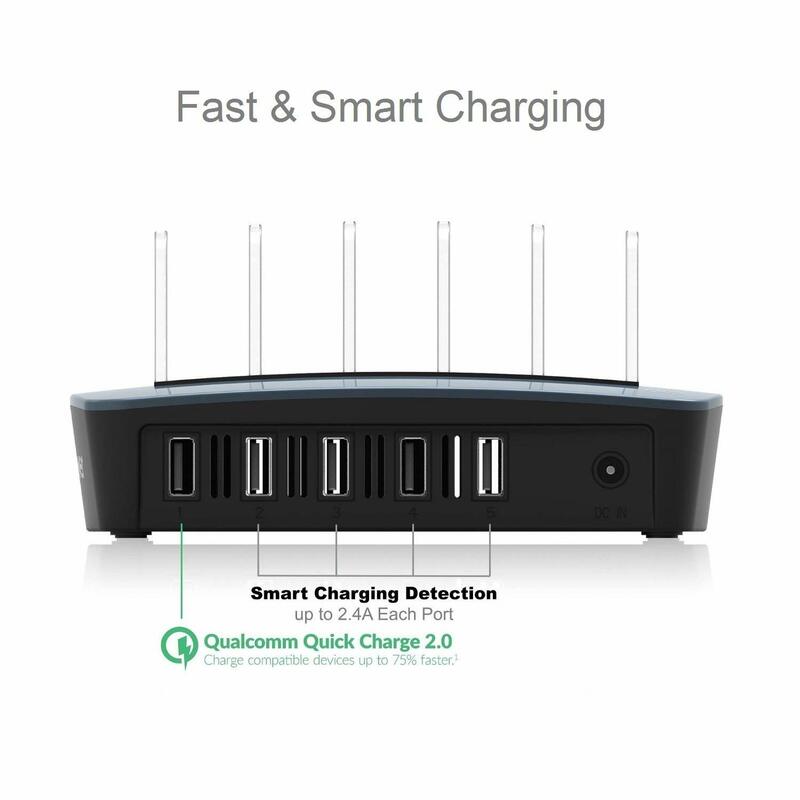 ■ QUICK CHARGE CERTIFIED: Charge a 3300mAh battery from 0 to 60 percent in 30 minutes with Qualcomm Quick Charge 2.0 (QC 2.0) compatible devices (charges up to 5 times faster than conventional USB chargers). Note: Qualcomm QC 2.0 is supported on a single port. ■ SMARTFLOW IC TECHNOLOGY: SmartFlow IC technology automatically delivers the maximum optimal charge for each charging device and protects your devices against over-heating, over-charging, over-current, short-circuits and unforeseen power surges. Note: Smartflow IC Technology is supported on all ports. 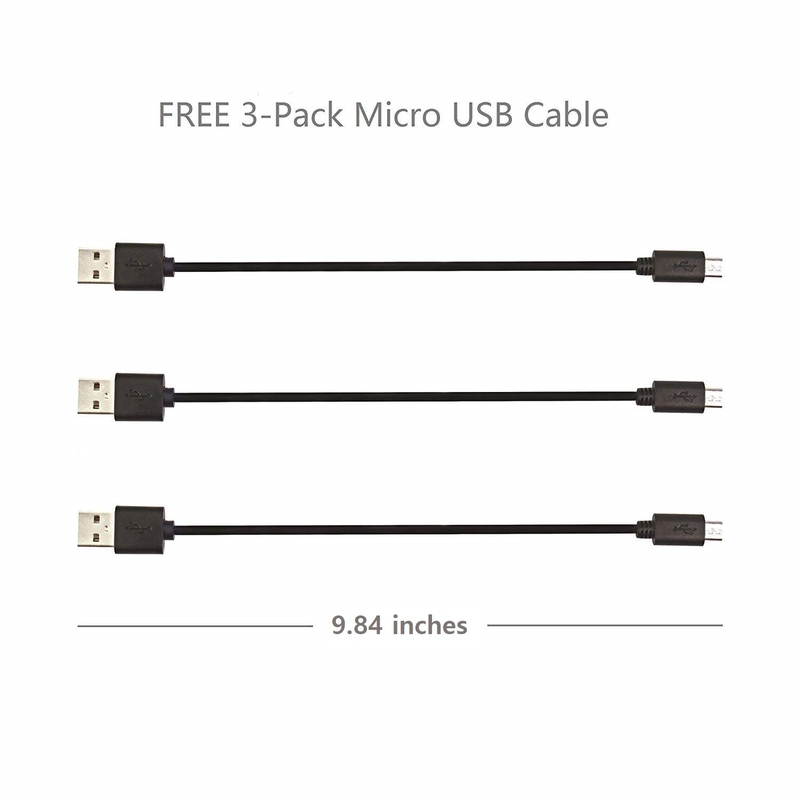 ■ VALUE PACK: Includes 3 USB-A to Micro USB Charging/Sync Cables (9.84 inches each). Perfect for Charging Stations. ■ PREMIUM CUSTOMER SERVICE: If you have any questions or concerns, please do not hesitate to contact us, our experienced tech support team in the Silicon Valley will get back to you within 24 hours. 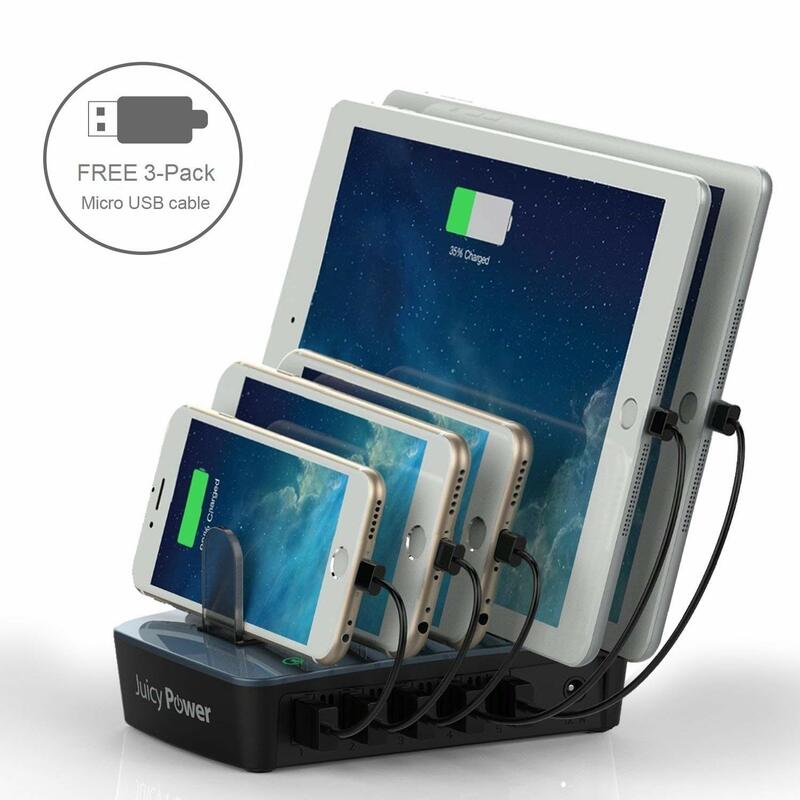 Juicy Power AVLT-CH14 5 Port 60W Qualcomm Quick Charge 2.0 Certified Fast Charging Station Dock – For iPhone, iPad, Android, Kindle and other Mobile Device - includes 3-pack 9.84 inches Micro USB Cables is made to meet all your devices' charging needs in one compact package. 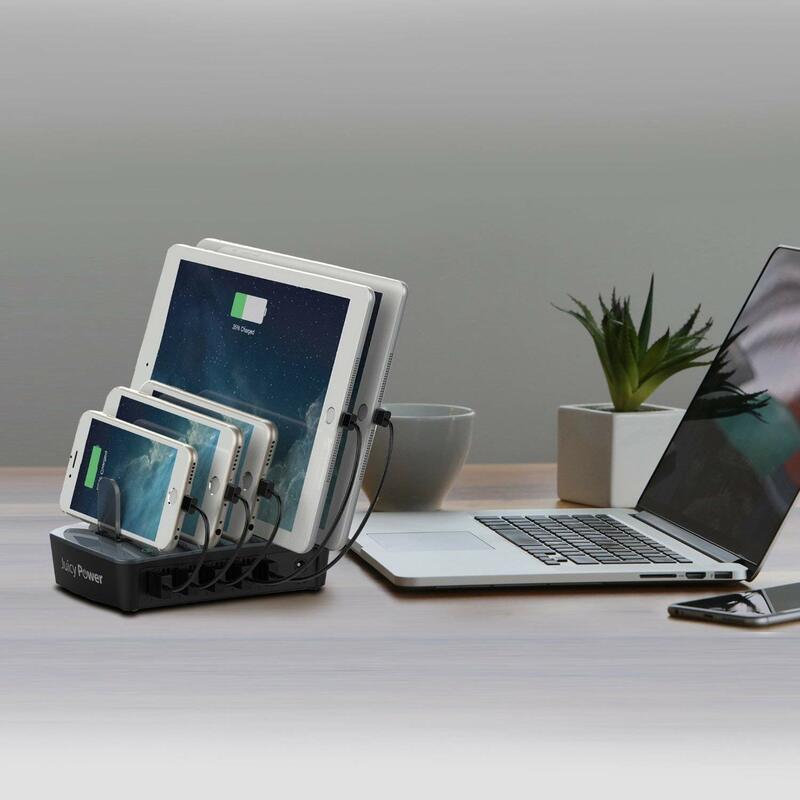 Anti-scratch cradles for your smartphones and tablets, and 3 USB charging & sync cables (0.98 inches each) designed for use with the charging station. 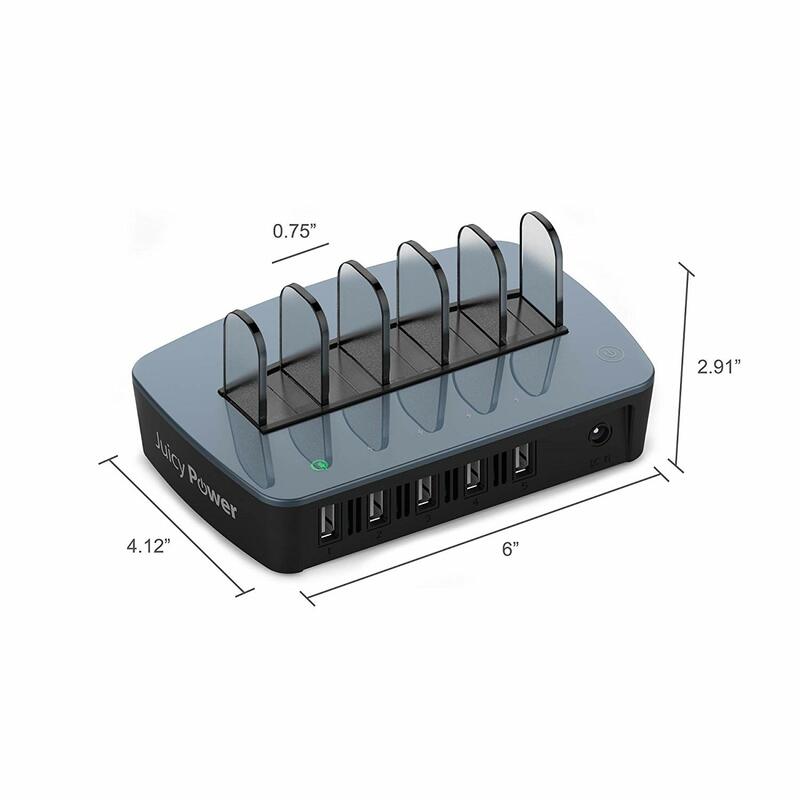 Now you will be able to free up your desk space from tangled cords and overcrowded wall outlets. Smartflow IC technology detects each devices charging requirements to supply the correct power delivery. This will not only charge your devices faster, but will also protect your devices from overcharging which leads to quicker battery deterioration. Please Note: When charging Qualcomm QC 2.0 devices, use cables with both charging and sync capability. If in doubt about the charging speed you're getting, use the original cables provided by your device manufacturer for the best charging results.